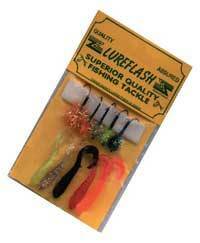 This device developed by Lureflash can help you beat the most subborn salmon anywhere. The extra split ring makes it almost impossible for the salmon to wriggle free once hooked stopping the fish using the lure as a lever. Try them, Lureflash were impressed and they're confident you will be too! 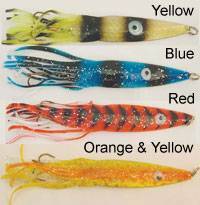 Great lures for summer mackeral and other species. There are 6 in a pack so you can make up a 6 rig or 2-3 rig. 1 of 3 Jig Head Kits. From shads to curly tails, a kit for every trip. Mini shrimps, put your hook through them and wait for the bite! 24 assorted wedges in three different sizes. 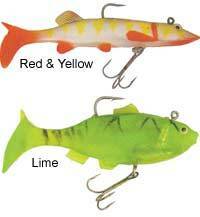 It is a versatile lure and can be used to catch many kinds of fish. 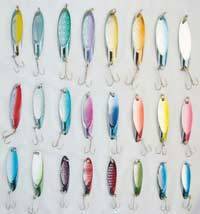 These life like lures are enough to tempt any pikes out of there hiding places.